Artichokes are packed with important minerals, vitamins and protein! The Artichoke is a low-calorie, very nutrient-rich veggie. 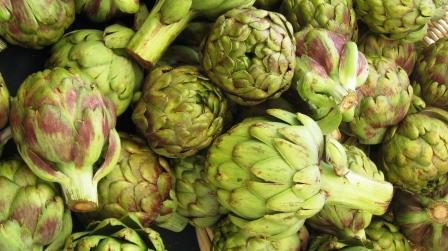 In fact one medium Artichoke is an excellent source of fiber and vitamin C, and a good source of folate and magnesium. Artichokes are also a great source of powerful disease-fighting antioxidants. Some recent research shows that prepared artichokes are the best antioxidant source among all vegetables. Artichokes are not only coveted for their beauty but also for their super-food qualities. Most people don’t see artichokes as a source of potassium, a mineral that’s vital to maintaining normal heart rhythm, fluid balance, muscle and nerve function. One medium Artichoke provides over 400 milligrams of potassium, which is about as much as a banana. There is strong evidence that a diet rich in potassium is linked to reduced risk of stroke. Potassium also lessens the effects of salt on blood pressure. Magnesium is very important for keeping and building healthy bones. Magnesium also manufactures proteins, releases energy from muscle storage, and regulates our body temperature. Many adults — especially women — aren’t getting enough of this mineral. Artichokes are a good source, but they can be expensive and out of season depending where you live. So fellow girls, please take your magnesium supplement and of course vitamins. Artichokes are an excellent source of vitamin C, a water-soluble vitamin that functions as a potent antioxidant. Vitamin C is vital for a healthy immune system. It also is important in forming collagen, a protein that gives structure to our bones, cartilage, muscle and blood vessels. Vitamin C also aids in the absorption of iron. We all know that fiber helps us maintain a healthy digestive system, lowers blood cholesterol, reduces the risk of heart disease and may prevent certain types of cancer. Fiber also works to keep blood-sugar levels stable, which is especially important for people with diabetes. It can also help us feel full, aiding in weight control. Artichokes are very fiber-rich, providing 10.3 grams in one Artichoke (120 grams). The USDA 2005 Dietary Guidelines for Americans recommend eating more plant-based protein in place of animal-based protein as a way to help reduce saturated fat and cholesterol intake. With no fat, cholesterol or trans fat, Artichokes are a healthful source of protein. One medium Artichoke provides four grams. Wow, so much goodness in one serving – this is truly a super-food. Our mission is to share healthy alternatives and introduce new foods and spices to you. Our hope is to help you change your relationship to food one bite at a time, mindfully and responsibly to a healthier you. This site has been built with the sole intention of sharing our way of life, our health triumphs due to the elimination of gluten and new world grains. We want to simply share other, what we believe to be, healthier ways of eating and experiencing foods. We are not associated with any licensed practitioners or are to be confused with providing health advice. Our recommendations and recipes are for your enjoyment and perusal. In case that you do experience or are currently living with some ailment, please consult a physician. We share our creations with you, but as common courtesy ask that you respect Nutty Kitchen with due credit when pictures or recipes are used. We kindly ask that you do not use any of our recipes for commercial purpose.